Every day we read or hear about some biological threat, whether it be from a potentially deadly strain of the flu virus, a prevalent pathogenic bacterium in foods like Campylobacter in uncooked chicken meat; or a seemingly safe FDA-approved drug that has been found to be unsafe like aspirin that induces bleeding gastric ulcers and brain hemorrhages; or pollutants in the air or water like the endemic fungus that causes Valley Fever or chlorine that decontaminates our tap water but increases risk for colon cancer; or toxic heavy metals like mercury or lead in our dental fillings and roadways; or parasitic germs like H. pylori, Candida albicans or Streptococcus that are commonly harbored in our own digestive tract. Then there is aging itself with all of the chronic diseases it brings with it – circulatory problems, insidious decline in vision from cataracts, glaucoma and macular degeneration, as well as fatty liver, excessive sugar levels and numerous malignancies. Not to mention excitotoxins like MSG, toxic sugars like fructose, hydrogenated (trans) fats in baked goods, carcinogens like nitrosamines, acrylamide or dioxin, or a newly described threat — advanced glycation end products produced from heat-processed sugary foods we eat. There are endless studies of each and every one of these and many other health threats, but no study that assesses these risks as a whole. Modern medicine addresses each and every one of these health threats individually and capitalizes on all of them by developing costly medicines and narrowly designed treatments that can be found in the voluminous International Classification of Diseases (ICD-volume 9) published by the World Health Organization and in the Merck Manual. Waiting for each and every one of these threats to occur and then attempting to treat them as they are detected appears to be folly. But that is precisely how modern medicine addresses prevalent health threats and runs up the bill. Mounting a defense against all of them would pose a considerable challenge as well. How many medicines would one have to take to fend off all of them? And in this era of germ resistance, we can’t habitually take antibiotics to ward off infectious diseases before they occur without inducing treatment-resistant forms of these germs over time. Is there anything available that counters all these threats? If an antidote DOES exist for all these health threats, it must be safe, widely available, not require a doctor’s prescription, economical and user friendly. It has to be something that people don’t have revulsion over, like the after-taste of cod liver oil. Vitamins and minerals are essential for health maintenance but there is no single nutrient that addresses all of these health threats. Upon careful examination, nature does provide one antidote for what ails modern society – garlic. Allicin is described as an ideal antioxidant particularly because of its broad application for prevention, therapy and aging. Garlic controls heavy metals such as lead, copper, cadmium and iron. Garlic is a remedy for fatty liver by virtue of its ability to remove iron. Garlic removes some heavy metals better than mineral-chelating drugs. While some herbal dietary supplements may increase circulating lead levels, garlic does not. Byproducts of oxygen, nitrogen and metals induce oxidation and damage to DNA and tissues. Garlic neutralizes all oxidants – oxygen free radicals, nitrogen free radicals, singlet oxygen and the dreaded hydroxyl radical. Garlic does not eradicate beneficial bacteria in the digestive tract. Garlic counters the effects of environmental chemicals and carcinogens such as dioxin, acrylamide and asbestos. Garlic counters the effects of poor health habits such as over-consumption of alcohol, tobacco use, and over-consumption of food. Garlic works synergistically or protectively with many medications, such as statin drugs, antibacterial and antifungal drugs, etc. Garlic counters the effects of aging on the pancreas, liver, brain, heart, arteries, kidneys and other organs. Garlic inhibited tumor necrosis factor (TNF) about 47% in one human study. TNF is a master marker of inflammation. Sulfur compounds in garlic calm and normalize the immune response so that the first arriving white blood cells (neutrophils) do not over-induce inflammation. Garlic counters the adverse effects of fructose, considered to be a toxic form of sugar. Kills off a broad spectrum of germs – bacteria, viruses, fungi, amoeba and protozoa and even ticks and nematodes as well as insect-borne malaria. Garlic molecules eradicate germs effectively without inducing germ resistance. Garlic is more effective than some antibiotics in the treatment of antibiotic resistance bacteria. The Centers for Disease Control says modern medicine is in the post-antibiotic era and may be entering a point of no return, when man-made antibiotics won’t work anymore. Allicin from garlic is posed as a possible answer to antibiotic resistance. Garlic extract has been demonstrated to protect against influenza viruses in laboratory mice. Given that the effectiveness of the flu vaccine is limited among those most at risk (the very young and the very old) for death from the flu and that most of the time the flu vaccine doesn’t match the strain of the flu virus in circulation, this raises the possibility lives are needlessly being lost because modern medicine overlooks garlic. Overreliance upon vaccines that deliver small amounts of viruses and bacteria in order to provoke antibodies has led to the problem vaccine- derived illness and the realization there will never be complete eradication of communicable diseases because of the fact vaccines have become the primary source of circulating infectious disease today. Garlic completely eradicates warts with no recurrence reported. Kills off intestinal parasites such as H. pylori (52% of Americans) and Candida albicans (70% of Americans). Protects babies from infection in the womb. Garlic is even effective in eradication of hookworm and tapeworm. While there are no commonly prescribe cancer preventive agents in use today, there are numerous studies that indicate allicin from garlic inhibits cancer. Garlic protects against carcinogenic nitrosamines in food. Garlic inhibits the enzyme required to produce cholesterol. Garlic intake is a predictor of whether a person will experience a stroke. reduced area of damage to the heart following a heart attack facilitated by garlic-derived hydrogen sulfide gas can be visualized, as shown below. Garlic, via its ability to generate hydrogen sulfide gas, is a potential treatment for heart failure. Garlic has been demonstrated to improve the blood pumping activity of the heart following chemotherapy-induced heart failure. Raw crushed garlic cloves yielding allicin, but not cooked garlic, effectively inhibits clumping of blood platelets and is known as a safe anti-blood clotting agent. In one lab dish study allicin completely inhibited blood platelets from clumping to form clots. Allicin, the primary active ingredient in garlic, is a more potent anti-clotting agent than aspirin. In one study no bleeding episodes were recorded among patients taking the blood thinning drug Warfarin and fresh garlic or garlic supplements. In another study, garlic pills did not produce bleeding episodes among genetically vulnerable patients taking Warfarin. Because of its mineral chelating (key-layting) properties, garlic addresses the aging process itself. It is aging that is responsible for most chronic disease. Garlic has been found to prolong the life of roundworms in a model of aging. Garlic activates internal enzymatic antioxidants via the Nrf2 gene transcription factor – catalase, superoxide dismutase, heme oxygenase and glutathione, which is considered an anti-aging effect. Garlic addresses the cosmetic side of aging. Garlic provides molecules that have been shown to inhibit skin wrinkling. Garlic is safer and more effective than aspirin. Garlic is safer than cholesterol-lowering statin drugs. A survey revealed that 8% of 657 patients taking dietary supplements consumed garlic pills (53 patients) and there were no reported side effects. The authors of this study considered potential drug interactions as “worrisome” but could not identify any instances where garlic produced problems when blood thinners were being used. A safety review did not find any published reports of adverse effect or mortality associated with garlic. Garlic does not appear to interfere with drug metabolism. It is agonizing to recognize how long garlic and its primary active molecule allicin have been disregarded in preference for synthetic drugs that have boxed mankind into a corner. The plagues of the Dark Ages may return due to germ resistance emanating from overuse of antibiotics. Aged garlic extract offers many proven health benefits, but lacks the pungent allicin molecule which is garlic’s best studied molecule. In one key study, raw crushed garlic providing allicin, but not boiled or aged garlic, prevented adverse effects upon coronary arteries. The importance of recognizing and obtaining allicin, its principal active ingredient, particularly because of garlic’s germ-fighting properties, has been underscored in this report. Raw crushed garlic cloves, by virtue of mixing the allicin-activating enzyme alliinase with garlic pulp, reliably produce allicin but because of its pungency and odor poses the problem of throat irritation and garlic breath. The pungency and odor produced by raw garlic cloves is an obstacle to public adoption of this natural remedy. Heating garlic cloves to reduce pungency and odor negates any production of allicin, its key ingredient. Over a decade ago enteric-coated garlic pills were initially found to reduce circulating cholesterol levels then later failed to do so due to a change in manufacturing. Enteric-coated garlic pills, designed to dissolve in the less acidic intestines rather than the acidic stomach, may not always be a reliable way to produce allicin. A 2007 trial published in the Archives of Internal Medicine conducted by investigators at Stanford Medical School using raw garlic, garlic powder, aged garlic extract failed to demonstrate a statistical or clinically significant effect upon cholesterol. This report generated negative news reports and a decline in the public’s interest in garlic at that time. Meanwhile, the challenge of overcoming garlic’s pungency and odor while delivering allicin, its key molecule, has finally been overcome. The availability of an alkaline buffered garlic capsule that assuredly delivers about 2500-2800 micrograms (2-3 milligrams) of allicin, about the same amount as a fresh-crushed clove of garlic, and that also eliminates garlic breath and odor, is a welcome development. Will adoption of this garlic pill into people’s daily health regimens occur? If so, a favorable change in health status and longevity in the population at large may be forthcoming. Given the many published reports extolling garlic, its lack of adoption by modern medicine is a major oversight. Predictably, there will be no doctor-led garlic revolution. Despite the overwhelming evidence and historical use of garlic, cholesterol-lowering statin drugs have been the central focus of the practice of medicine for the past 30 years. 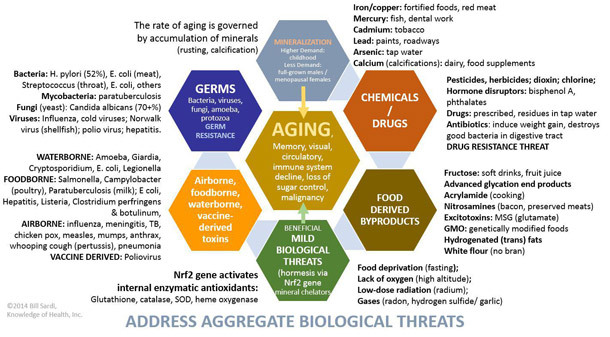 An assessment of aggregate health threats provides a more comprehensive view of health threats that humans face on a daily basis. The practice of addressing each and every biological threat as they occur has led to point where the cost of medical care is beyond affordability. While the broad biological action of vitamin D and polyphenols such as resveratrol, curcumin, quercetin and catechin are just now being realized, garlic-derived allicin is posed as the most comprehensive, economical agent that could usher in an era of truly preventive medicine. ©2014 Bill Sardi, Knowledge of Health, Inc. Disclosure: Bill Sardi has a financial interest in dietary supplements.